Our photo challenge for the months of April and May is Urban Decay. Each photo challenge has a set of guidelines, which are listed below. Please be sure to read everything below, before submitting your image. CHALLENGE: Urban Decay is all around us from rusting cars to deserted old buildings. 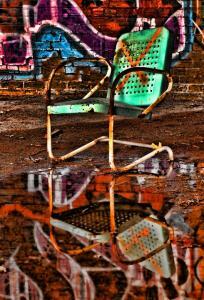 Be creative, think outside the box and give us your best shot of Urban Decay. RULES: As long as the majority your image represents the theme, this challenge should leave you limited only by your imagination. IMAGE: Only ONE image per member may be submitted. Additional entries will be deleted. JUDGING: The top three images from the submissions will be judged and critiqued. Points will be awarded for every submission as well as additional points for winners. See Challenge Points below for more info. SUBMISSIONS ACCEPTED UNTIL: May 31, 2012. READY TO SUBMIT? CLICK THE IMAGE BELOW. NOTE: Our monthly member challenges are designed to keep you shooting on a regular basis. To that end, all images submitted, must be have been created within the last 120 days (4 months). Please do not submit past work. December 1, 2011 and May 31, 2012. SUBMITTING YOUR IMAGE: After processing your image, please set the resolution of the image at 72 dpi and size it so that the longest dimension of the image is no smaller than 1000 pixels and no larger than 1024 pixels. Save your image as a jpg. Please name your file using your first name initial and full last name, and title of image. Example: KKyle_Riverofclouds.jpg. PRIZES: Top three images will be awarded! Prizes include a Backyard Shots guide, Tamron eco-friendly bag and Tamron lens cleaner cloth. CHALLENGE POINTS: Each entry submitted will earn 5 points. Points awarded for each place are as follows: First Place - 5 points; Second Place - 3 points, and Third Place - 1 point. Contest is open to all photographers at least 18 years of age. You must be a member of BackyardShots.com. Membership is free at BackyardShots.com. We would love to have you LIKE us Facebook page as well, but it is not a requirement to enter our challenges.